Tom Wiffler, chief operating officer, UnitedHealthcare Military & Veterans, announces new $800,000 partnership grant to Peak Military Care Network in Colorado Springs, Colo., to help the organization strengthen its partnership alliances and build support networks for service members, veterans and their families. The grant was announced on Military Spouse Appreciation Day, Friday, May 6, where UnitedHealthcare and Optum employees, community leaders and elected officials were on-hand to distribute 250 “Family Movie Night” gift baskets to military families of service members who have recently returned from overseas deployment (Video: Carson Nyquist). (L-R) Military spouse Lindsay Kester and son Elias, 3, receive a high-five from Kate Hatten, president and CEO, Peak Military Care Network, along with one of the 250 “Family Movie Night” gift baskets that were distributed as part of Military Spouse Appreciation Day in Colorado Springs, Colo. Also pictured l-r: Tom Wiffler, chief operating officer, UnitedHealthcare Military & Veterans, and U.S. Congressman Doug Lamborn (R-Colo.) (Photo: Teresa Lee). COLORADO SPRINGS, Colo.--(BUSINESS WIRE)--Service members, veterans and their families in the Colorado Springs area will have access to expanded support networks through the Peak Military Care Network (PMCN), funded by a three-year, $800,000 United Health Foundation grant. The grant was announced today, in honor of Military Spouse Appreciation Day, during a special “Welcome Home” reception for military families. PMCN connects people to information and services through a collaborative network of military, veteran and community-based organizations that supports the individual and the family, including advocacy, behavioral health, child welfare and crisis intervention, education, workforce readiness, medical and physical health, social services, and transition and reintegration. providing case management support to help those with multiple or complex issues in order to address immediate and long-term needs, including improved health and well-being. The Pikes Peak area is the only region in the United States to house a major Army installation (Fort Carson), three Air Force installations (Peterson Air Force Base, Schriever Air Force Base and Cheyenne Mountain Air Force Station), and a leading service academy (U.S. Air Force Academy). One in four residents is a former or current member of the military, making the area home to one of the highest concentrations of service members in the nation, according to PMCN. More than 25,000 soldiers are stationed at Fort Carson alone, double the total from 2006. Several elected officials and community leaders participated in the event, including Congressman Lamborn. “Military spouses are like tempered steel. They have been in the fire and come out stronger and better. I'm very proud to have been a Military spouse. These spouses deserve everything we can do for them,” said Mrs. Jill Renuart, spouse of General Gene Renuart, U.S. Army, Ret. Former commander. 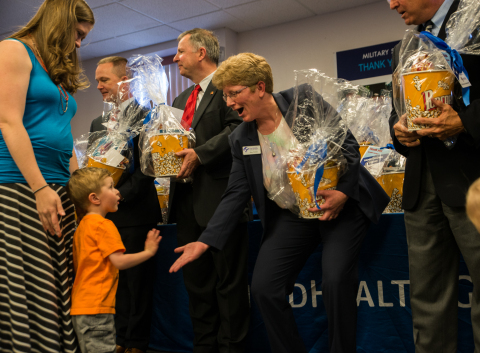 The grant was announced on Military Spouse Appreciation Day, Friday, May 6, at the Pikes Peak Area Council of Governments during a “welcome home” event for spouses and families of service members who have recently returned from overseas deployment. Volunteers, including elected officials, community leaders, and UnitedHealthcare and Optum employees, distributed 250 “Family Movie Night” gift baskets to military families of service members. PMCN is a coordinating entity that has built a network of collaborative partners to better meet the needs of our region’s military and veteran community. PMCN promotes health and well-being by connecting service members, veterans and their families to critical resources and services to meet complex needs by fostering coordination, collaboration and partnerships among service providers; training community-based providers; and conducting outreach to providers and our military and veteran communities to increase knowledge of and access to resources. Through collaboration with community partners, grants and outreach efforts, United Health Foundation works to improve our health system, build a diverse and dynamic health workforce and enhance the well-being of local communities. United Health Foundation was established by UnitedHealth Group (NYSE:UNH) in 1999 as a not-for-profit, private foundation dedicated to improving health and health care. To date, United Health Foundation has committed more than $285 million to programs and communities around the world. We invite you to learn more at www.unitedhealthfoundation.org or follow @UHGGives on Twitter or Facebook.com/UHGGives. 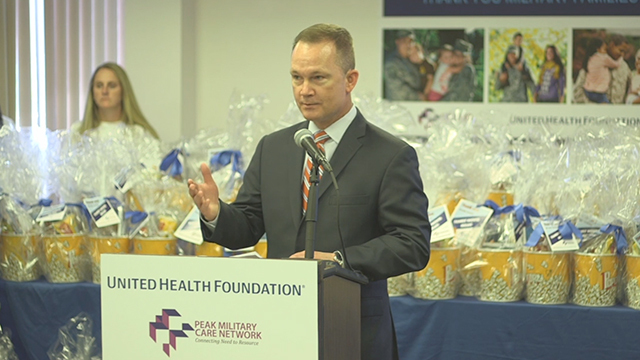 Colorado Springs-area service members, veterans and their families will have access to expanded support networks through PMCN, funded by a three-year, $800,000 grant by United Health Foundation.